(CNN) -- Irish flanker Alan Quinlan will miss the British and Irish Lions rugby tour of South Africa after being banned for 12 weeks. Quinlan's suspension means he becomes the third selected player to miss out on the British Lions tour. 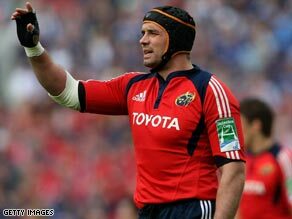 Munster's Quinlan was found guilty of making contact with the eye area of Leinster captain Leo Cullen during their Heineken Cup semifinal at Croke Park, Dublin on May 1. Quinlan's suspension means he is sidelined until September 10 -- more than two months after the Lions tour ends. Rugby's summer-off season is not included in the period he cannot play. The Ireland international has a right of appeal, but Lions head coach Ian McGeechan must now consider a replacement, with Leicester and England flanker Tom Croft favorite to be called-up. Quinlan, 34, becomes the third player selected in the 37-man Lions squad last month to be ruled out of the tour. Quinlan's Munster colleague, scrum-half Tomas O'Leary, broke his ankle three days after the party was announced and has subsequently been replaced by Scotland captain Mike Blair. Wales center Tom Shanklin then suffered a serious shoulder injury -- like O'Leary, he was also on Magners League duty -- and faces four months out. Shanklin's replacement has not yet been announced. McGeechan's Lions squad fly to Johannesburg on May 24 and play their opening game against a Royal XV in Rustenburg on May 30. The 10-match trip culminates with three Tests against world champions South Africa in Durban (June 20), Pretoria (June 27) and Johannesburg (July 4).